I used to be of the school-should-not-start-until-after-labor-day-what-is-wrong-with-you-people persuasion, but this year, we are starting school on August 20th. I just wanted to give us a little more wiggle room. That means our first day of school is a mere three weeks away, as of the typing of this post. While I'm intending on doing a post about my curriculum picks for 2nd grade, right now I have my hands full trying to find pockets of time to get everything organized and finalized for the year! So, I thought I'd just share a few of the resources for homeschool planning that I've been loving lately. The Lovely Homeschool Course - I snagged this homeschool planning course earlier this year for a great deal, and it has been 100% worth the money. The course comes with editable PDF files to help you plan out your year. Last year, with having a baby in the middle of the year, we mostly kept things flexible, which was what we needed then. But this school year, I was hoping to develop more of a routine. This course is letting me plan things out while still letting me leave room to be flexible, so it's just what I needed. Better Together - This is a book written by Pam Barnhill, all about "Morning Time". 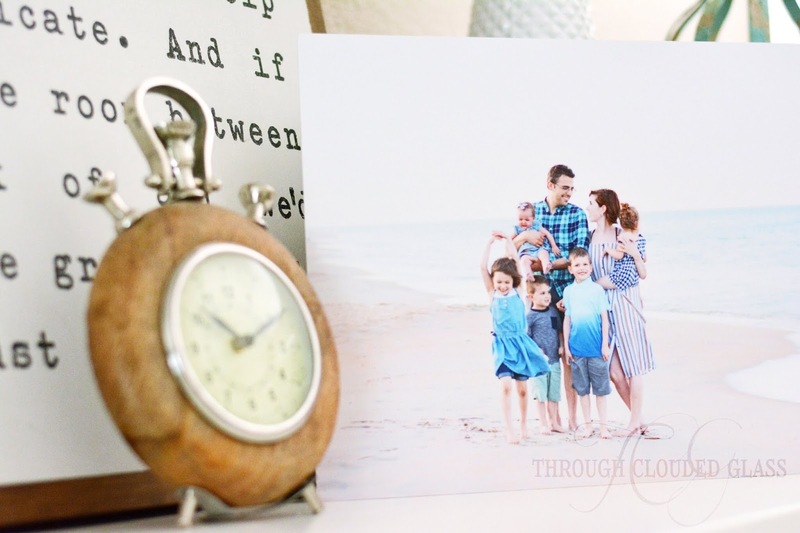 If you haven't heard of Morning Time, it's something many homeschool families incorporate into their day. If you have a homeschool friend, ask them if they do Morning Time, and you'll sound like you know what you're talking about. Basically it's a time to gather together for Bible reading, singing hymns, memorizing Bible verses, reading books together, or whatever else we want to do. 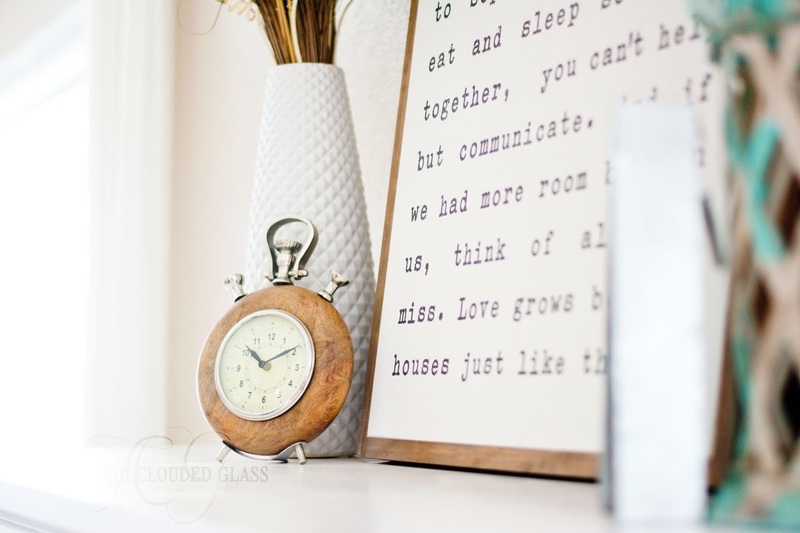 Morning Time is something I really want to incorporate into our daily routine this year - what I love is that this would be a time for all of my kids to learn something together, even the littlest ones. 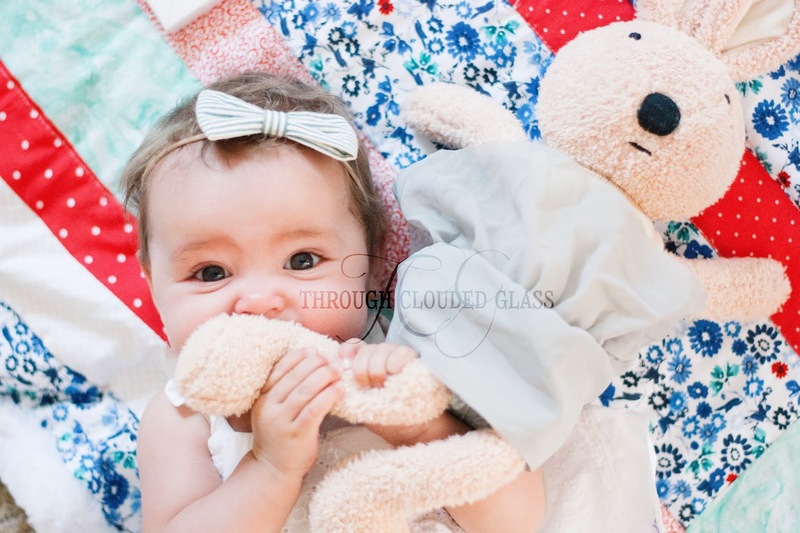 As they grow, I think it will be a wonderful tool to connect as a family, even as I have a large range of ages. This book gives some practical tips for morning time, as well as addressing the "why" of it all, and it's making me excited to get started in a few weeks. Simply Charlotte Mason - Stay tuned, because a post about my curriculum picks for 2nd grade is coming, but this year we decided to try out a local co-op. We will meet with other homeschool families once a week, and the little kids will do some activities related to the subjects of literature, history, and science. It'll be fun social time for all of us. The downside is that we have to at least kind-of-sort-of keep up with the curriculum they pick. I have my own curriculum I'll be working through with my kids this year, but we'll also have to go over what we're learning at co-op. They picked the Middle Ages to study for history this year. Now, you have to understand that the Middle Ages has never been my personal favorite period of time to learn about, and the curriculum they picked is okay but...well, a little dry. I'm actually not looking forward to it, and that's a problem for me. My whole philosophy for elementary-level History education is that if we aren't enjoying it, we aren't doing it right. Enter Simply Charlotte Mason. I remembered that they have recommended book lists for every historical era, for every age group, so I checked out their list for 2nd grade level Middle ages, and I am relieved to find some fun supplementary books to add in to our read-aloud rotation that look more interesting to me! If I'm more interested, my kids will be more interested, and we'll all be happy. Basically, Simply Charlotte Mason is my new go-to for books to make boring subjects interesting. The Read-Aloud Family - Speaking of booklists, I'm relying pretty heavily on this book when picking read-aloud books for our morning time. And if you haven't listened to the Read-Aloud Revival Podcast, get yourself over to iTunes and get inspired! This article about Loop Scheduling - Sometimes I have too many ideas and not enough time. There are all kinds of books and resources I want to use, but if we tried to use each of these every day, we'd be doing school until dinner time (or later), and that's not reasonable. When I read about loop scheduling last year, it made so much sense. I have a whole list of "extras" worked out, things I want to loop through every couple weeks, and I'm really looking forward to incorporating subjects and activities we wouldn't be able to get to otherwise! 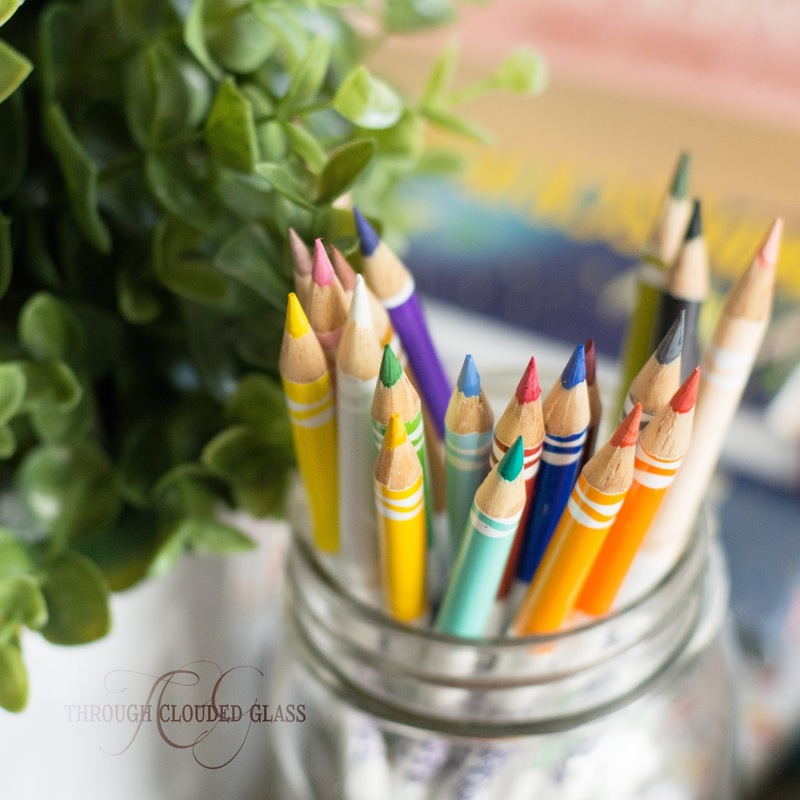 This post from my blog friend Elisha about her homeschooling method - Read through the article - basically that peaceful, joyful tone that Elisha is hitting is my goal for our homeschool, no matter what method/curriculum we are using! That's all I have for now, stay tuned for a curriculum post coming up...sometime soon! When we bought this house, the basement was unfinished. 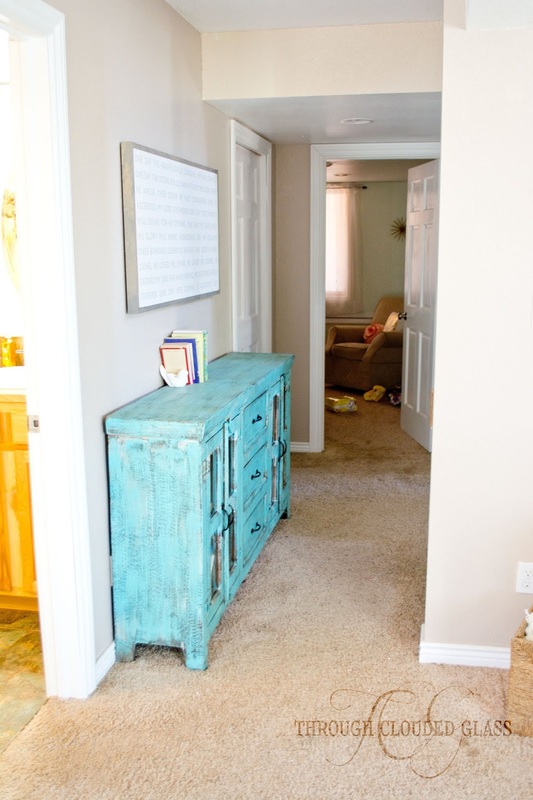 When I got pregnant with Wyatt, we decided to tackle the project and we finished it right before he was born! 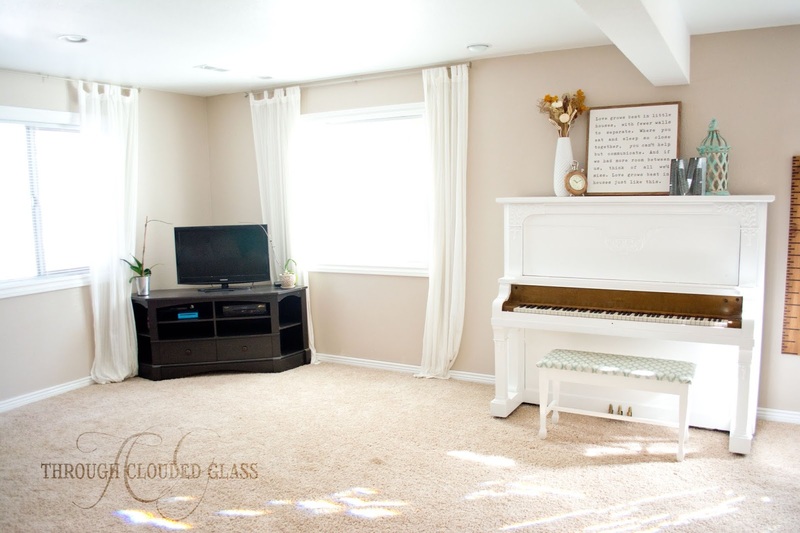 Still, for a long time we let the downstairs sit empty, but when I was pregnant with Clarice and decided I wouldn't be continuing to work, I saved all my pennies to decorate this basement family room. 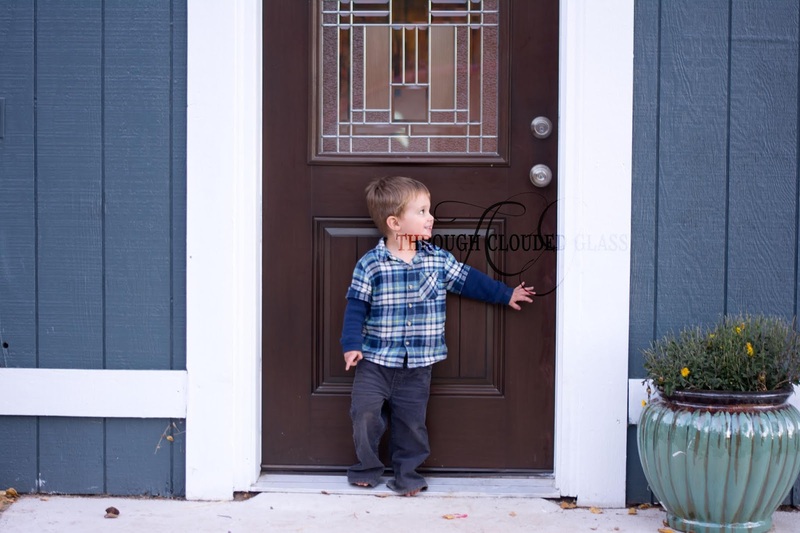 This is the door we most often use to come into our house. 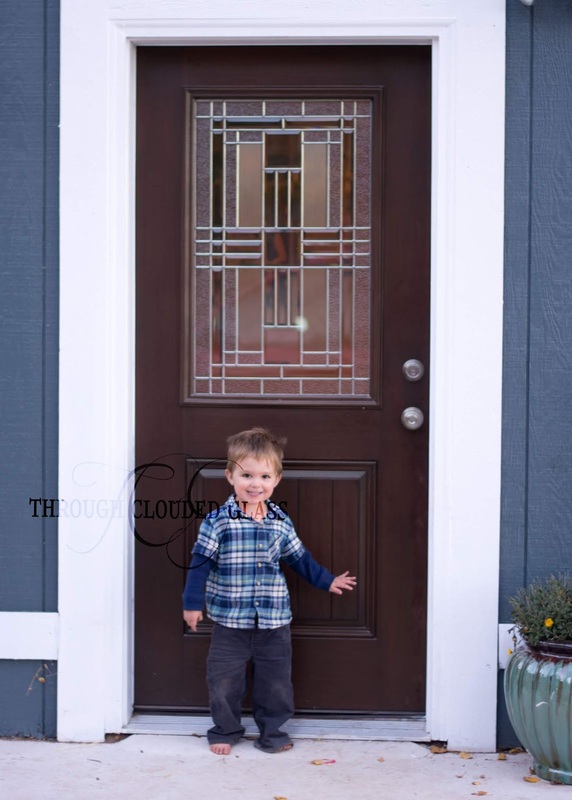 It's also the door that guests most often use. I wanted to make sure people were walking into more than just an empty room. A few months later we repainted and got the rest of the furniture. Two years later, I'm still happy with it. 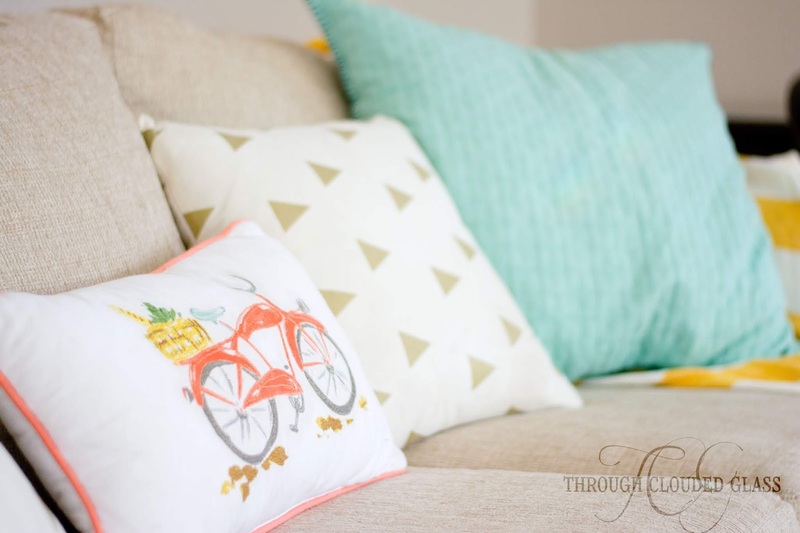 If I had to do it over, I might just go with a more adventurous couch color (my tastes just keep getting more colorful), but the rest would stay mostly the same! 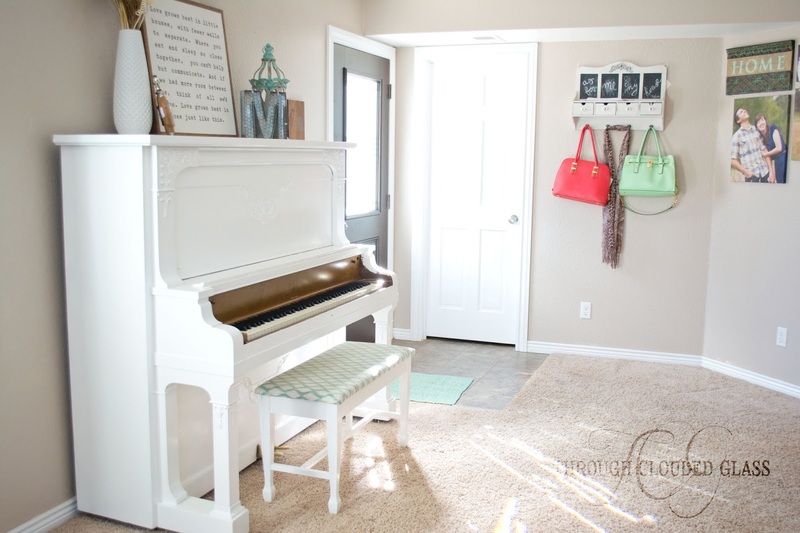 I took these pictures two years ago, and the only things that have changed are the purses hanging by the door, and the piano-mantel, which I update periodically. We mostly use this room for the occasional movie, and Derek works down here on the days he works from home. Just in case you are wondering: the square prints on the chicken-wire bulletin board are from Artifact Uprising and Parabo Press. 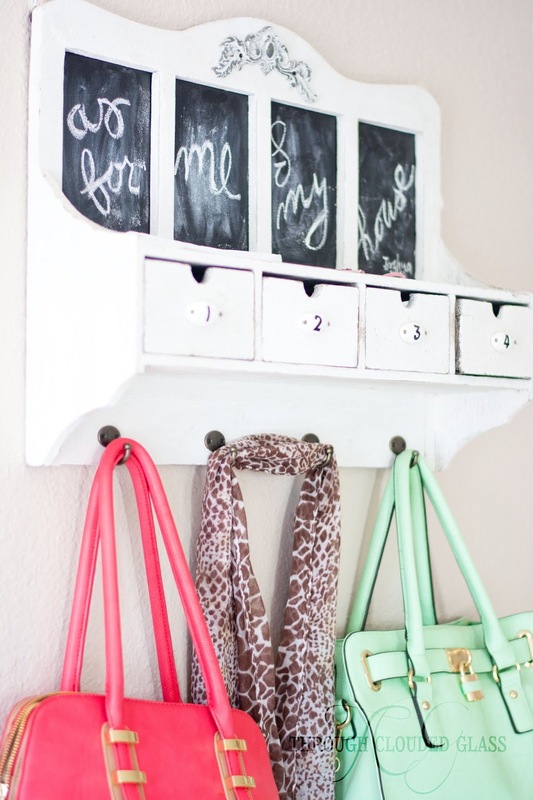 The rest is a miss mash of stuff from Hobby Lobby, Walmart, Target, and Ikea! The text signs are particularly special to me (from House Of Belonging, in case you are wondering). The one above the blue cabinet has my favorite verse from the hymn "O Glorious Day". I wanted more on our walls that symbolized who we are as a family and pointed us back to Christ. 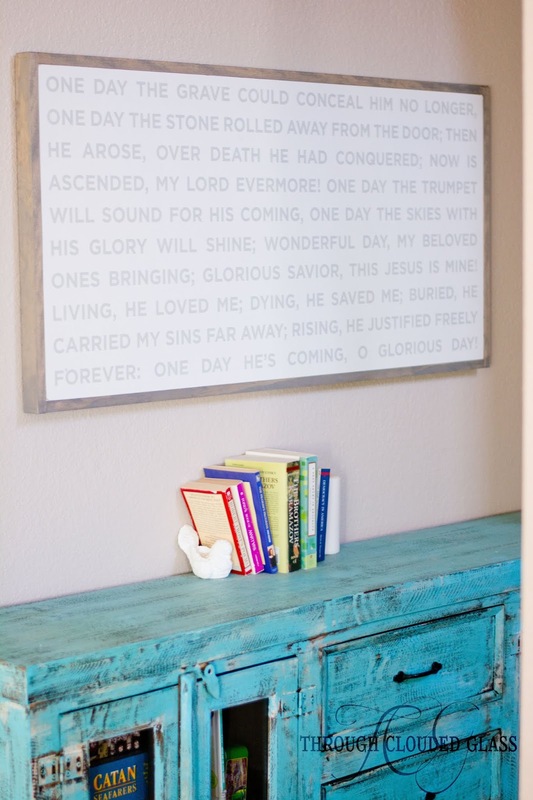 This hymn verse communicates the Gospel and refocuses us on eternity, and I love that it's hanging on our walls now! Now He arose, over death He has concurred! Now He's ascended, My Lord evermore! Buried He carried, my sins far away! Rising He justified, freely forever! One day He's coming! O glorious day!" 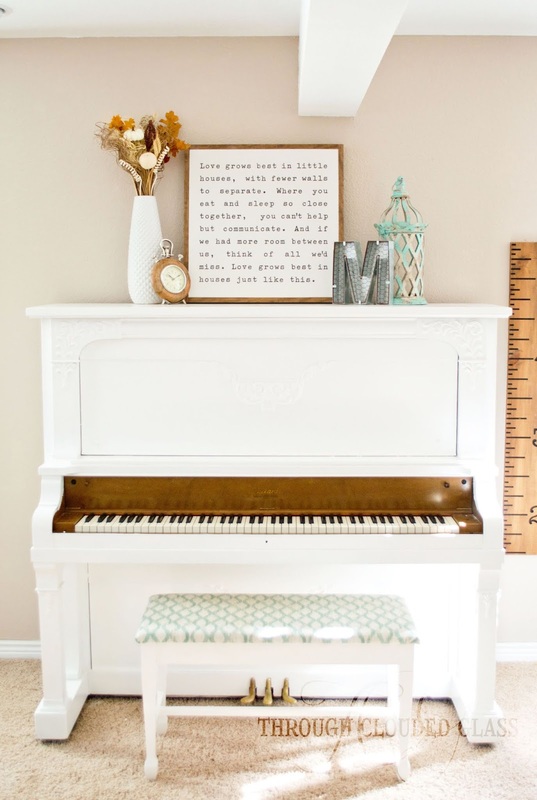 The second sign on the piano appealed to me because the quote spoke directly to my heart. The reason we almost moved is that this house is very small for our big family, and we go through periods when we feel discontent. 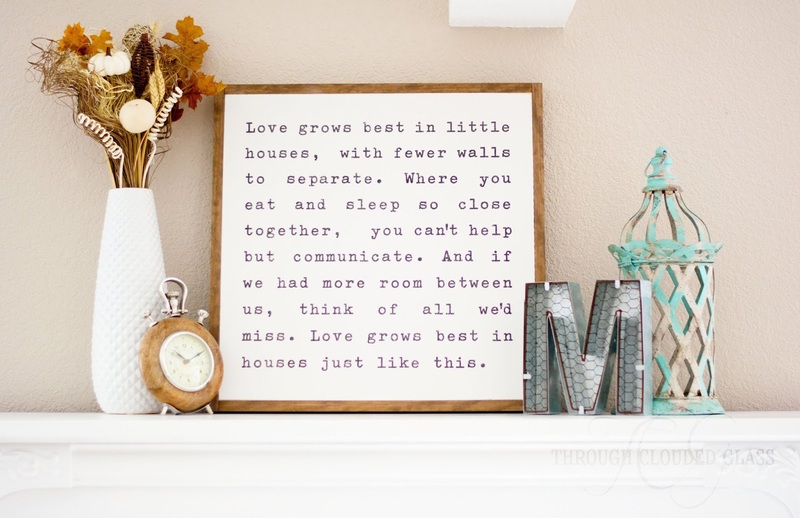 But this quote reminds me, whenever I look at it, that there are good parts to living in a small house too. I recently learned this quote is from an old country song called "Little Houses" by Doug Stone (oh, I miss that good ole country music!). I looked it up on Spotify, and it's super-sweet, and almost feels autobiographical for me. 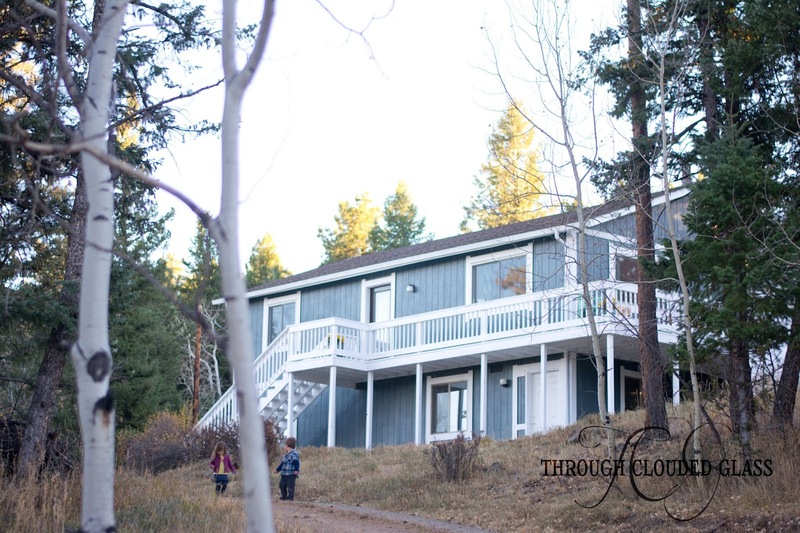 We moved into this house as newlyweds, and brought all our babies home here, and even though it feels small, it's full to the brim with noise, and laughter, and love. So I've come to love our little house over the years. Think of all we'd miss. Love grows best in houses just like this." Here's the linkup if you want to join in! When we first bought our house it was painted an ugly tan color. Truly, it was ugly. One of the first things we did when we moved in was to paint it. What I couldn't figure out was what color to paint it. 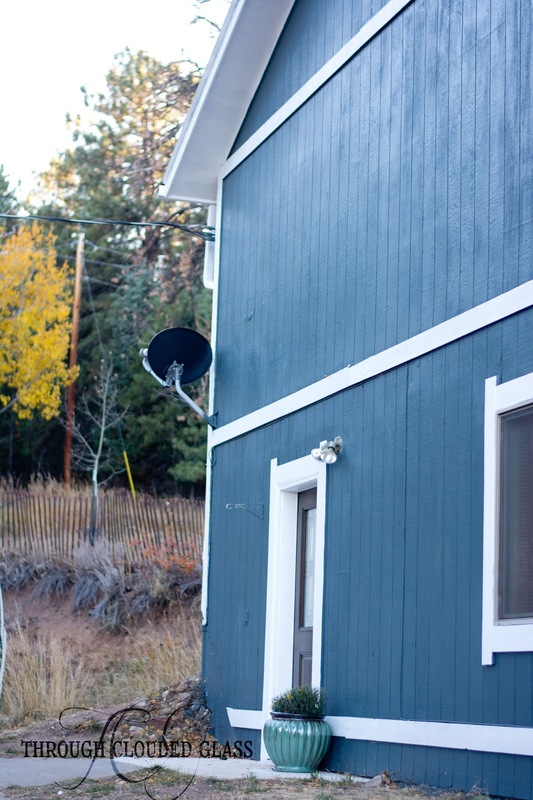 In the mountains, most homes have lovely cedar siding, maybe even with log accents. This house had none of those things and needed paint. 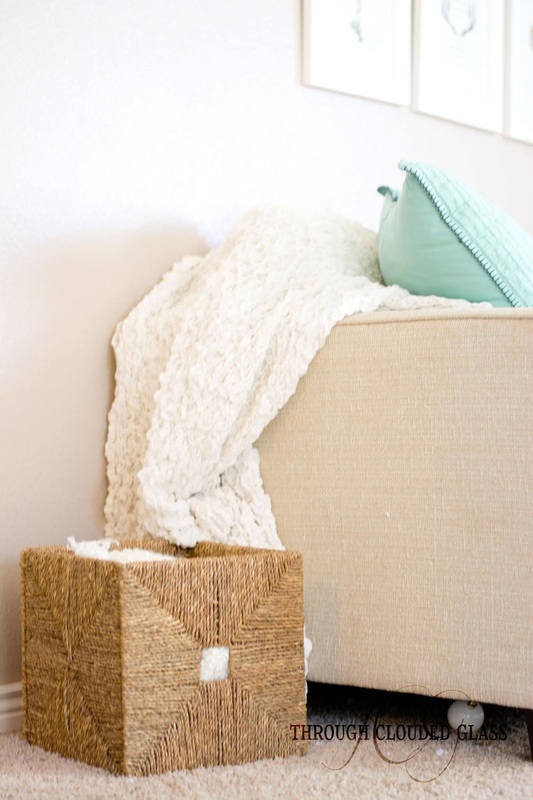 But as a young newlywed with no experience picking paint colors, I had no idea what to choose. 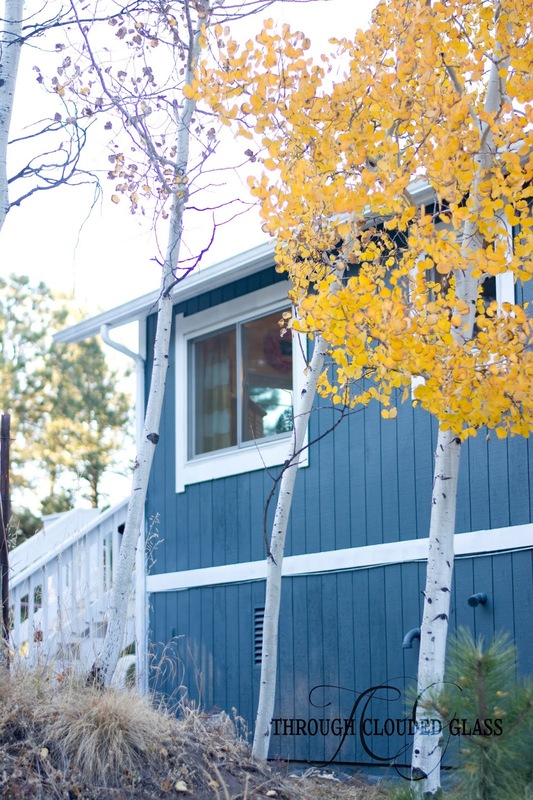 What was a good color for a mountain home? I ended up going with a pale green, with darker green trim, but I was never completely satisfied with it. 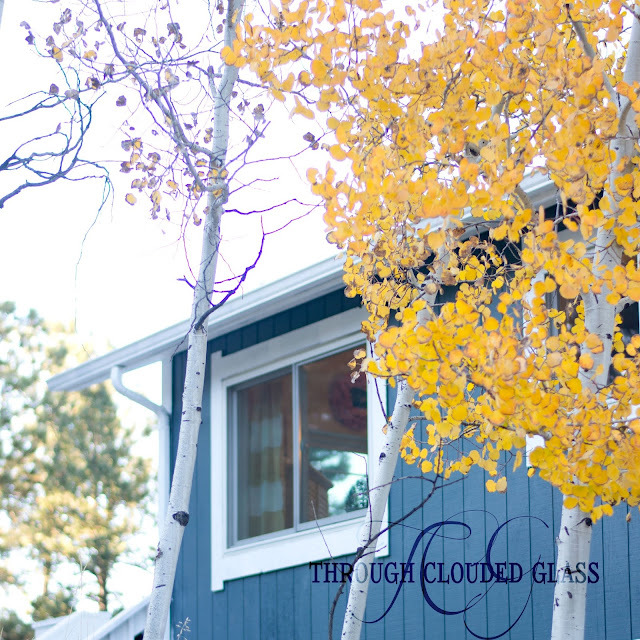 A couple years ago we undertook a major remodel after realizing that moving wasn't in our near future. 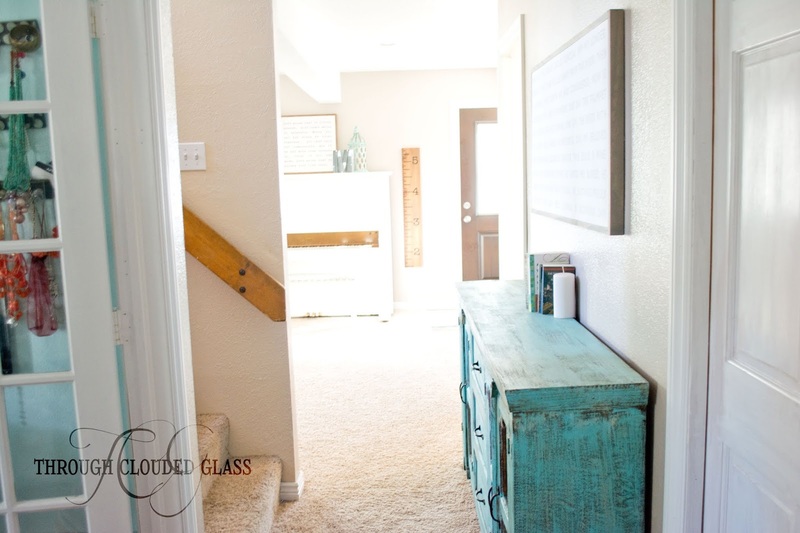 If we had to stay where we were, it was finally time to put some effort into making this house look the way we want, to make it comfortable and pretty for however many years we would be here. Most of the projects were on the interior, but I felt like the outside needed to match the newly polished inside. I chose Le Luxe by Behr. Derek taped up the trim and started spraying the outside of our home, and I have to say, we were both terrified. It looked so...dark! It looked almost black! 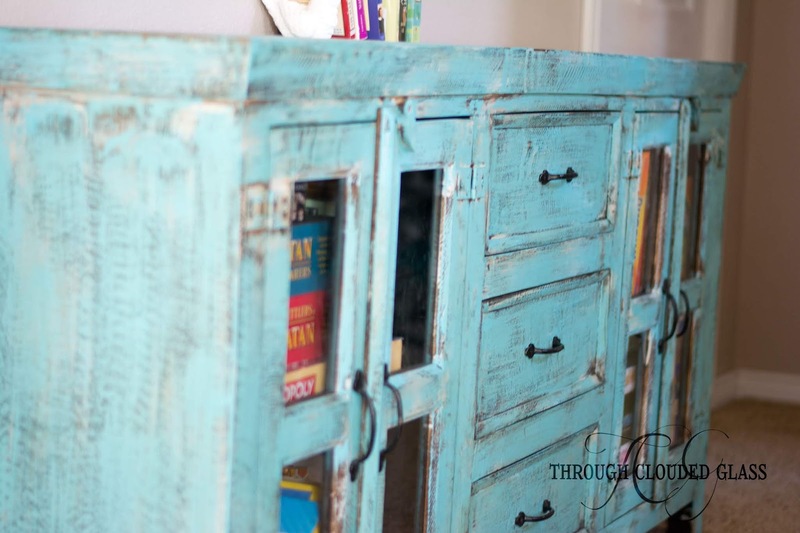 But we persevered, added the white trim, and in the end I loved the color so much. 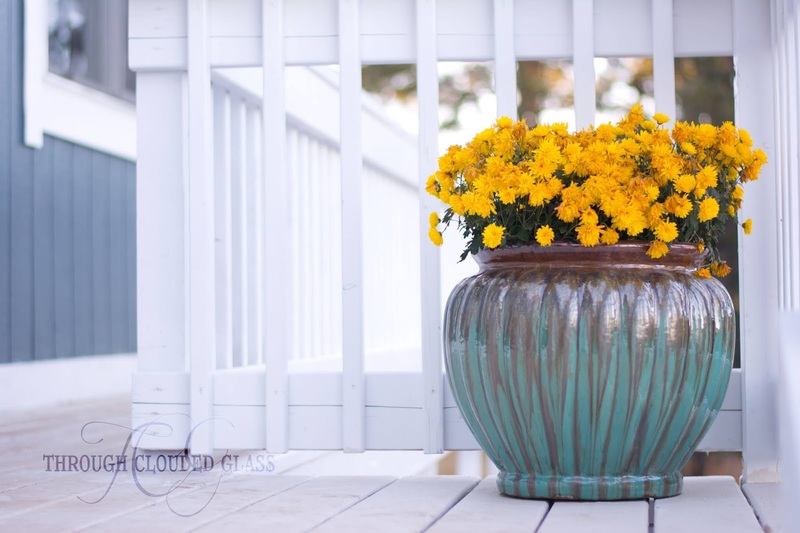 Now our house not only looks polished, it's the perfect color backdrop for my instagram photos! Most mountain homes still have cedar siding, but I have to say, I love the way this color looks for a mountain/forest home. It brings to mind stone or slate, it doesn't match the surroundings, but it goes. I love the way it turned out! If you follow me on Instagram, you saw that I invited you all to join in on sharing photos of your house over the next month! 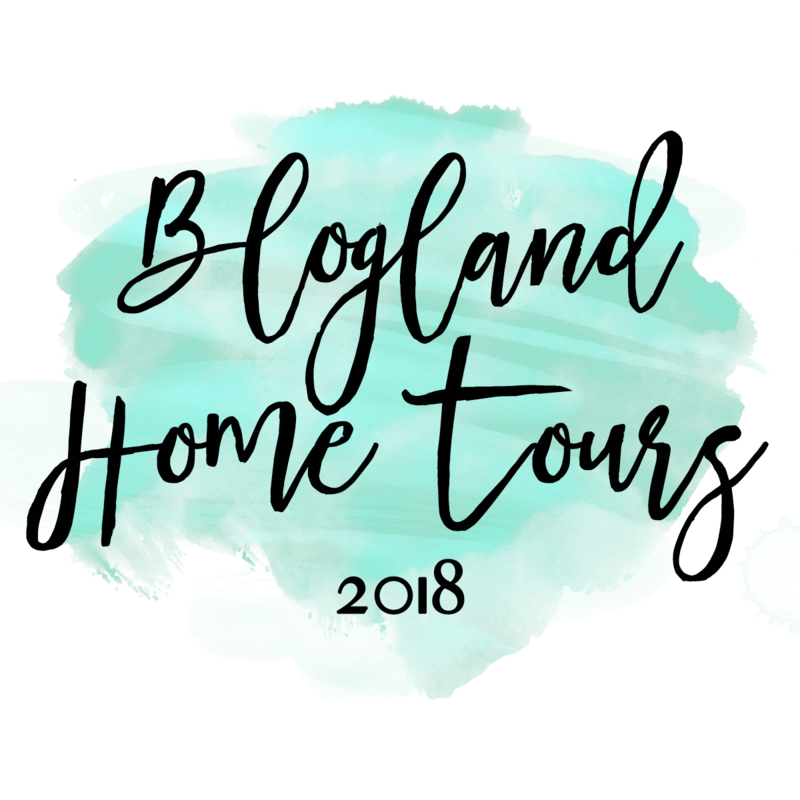 I'm running a linkup, just because it might make it a little more fun (or if you are on Instagram, use the hashtag #bloglandhometours). Share photos or even stories of your home, write as many posts as you want and organize them however you want, and come share them here so we can all check them out! No need to link back here unless you want to, but I do reserve the right to delete links that do not fit this linkup. 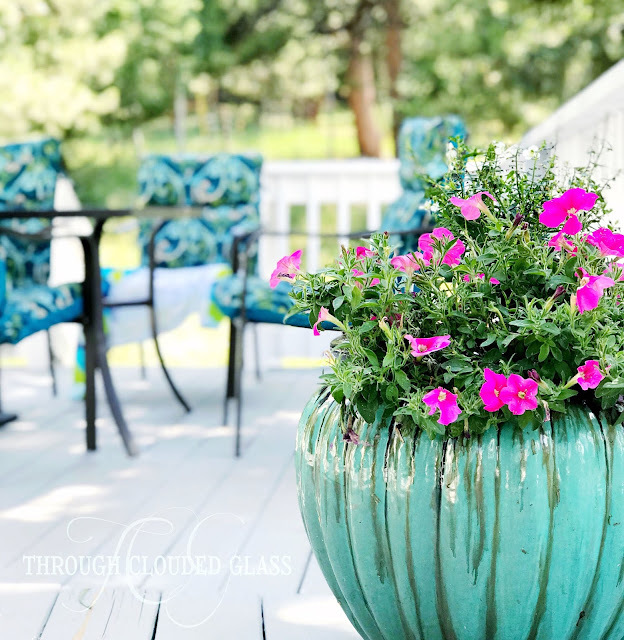 I'll share the same linkup in each post, so come back and share on any of my house posts for the next month or so! I can't wait to see everyone's homes! It's like we're all having coffee at each other's houses! If I had to pick one sound the represents summer to me, it would be hummingbirds. Every year, growing up in the mountains, my dad would put out a hummingbird feeder. People in the city probably do this too, but in the mountains, houses are spread out enough that there are less feeders, and therefore more hummingbird per feeder. 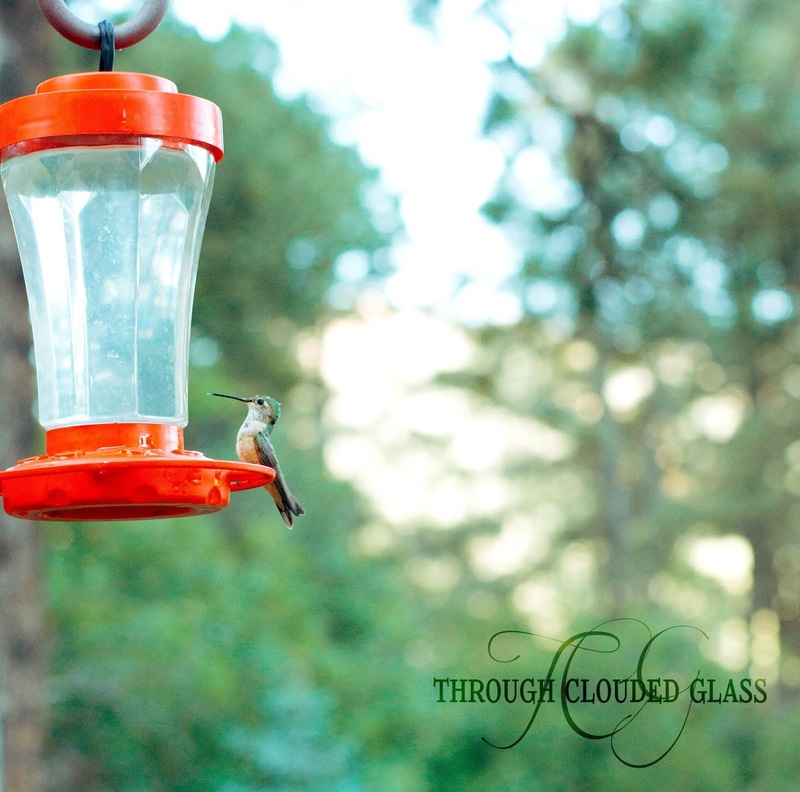 We used to get swarms, literal swarms, of hummingbirds around our single feeder. We'd watch them from our kitchen window, marvel at how you couldn't even see their wings, get ready to boil more sugar water when the feeder started to get low. Last year I put out a hummingbird feeder for the first time in my adult life. I honestly don't know what took me so long, because like my dad, I love those little hummingbirds. I bought the feeder, filled it with liquid sugar, and hung it in my kitchen window, just like when I was growing up. I hung it a little late in the season, so it took the birds a while to find it. We ended up with a little lone hummingbird that year. This year Derek has taken over the hummingbird feeding duties, and he reminds me so much of my dad. The way he keeps an eye on the feeder, counts how many birds we have, and feels protective of them when something goes wrong. What could go wrong in hummingbird land, you may ask? A Rufous, that's what. Rufous hummingbirds are little orange/red birds that take over your feeder and chase all the other hummingbirds away. They are mean, they are pests, and unlike our usual Ruby-throat hummingbirds, we have no fondness for them at all. I came home from the gym the other day and walked around the house. I couldn't find Derek. I checked outside, and there he was, standing outside with the hose, getting ready to scare that bully hummingbird away with some water. It wasn't a bad idea (I actually think it was rather brilliant), but I had to laugh, because in that moment I felt like we had become my parents (when it comes to hummingbirds anyway). The kids are joining in too. Wyatt is especially fond of birds, and has been since he was 18 months old (I kid you not). I used to carry him through the zoo, and he wasn't interested in the bears or the giraffes or the zebras, but every time he saw a hawk or flamingo he would point and cry out "Bird!". He still examines bird books, draws birds, and wants to know everything he can about birds. I love that he loves birds! I am hoping as the kids grow older and less likely to cry, we can become a real birding family. The other day I walked outside to find the boys running around with their butterfly nets. "We are going to help daddy and catch that mean orange bird!" They've been chasing it around with their nets ever since. If I actually thought they'd catch it, I'd be worried, but as it is I just find it completely adorable. I am sitting on the porch, typing this, and there are multiple hummingbird sounds, swirling from every corner of our one acre of earth. Wyatt grabs my phone to ask Siri how to catch a hummingbird. This is summertime in the mountains. Do you ever wonder if it's narcissistic that we decorate our houses with pictures of ourselves? A few years ago I heard someone mention how it could be narcissistic to decorate with photos of yourself, and for a long time I wondered if maybe that was true. 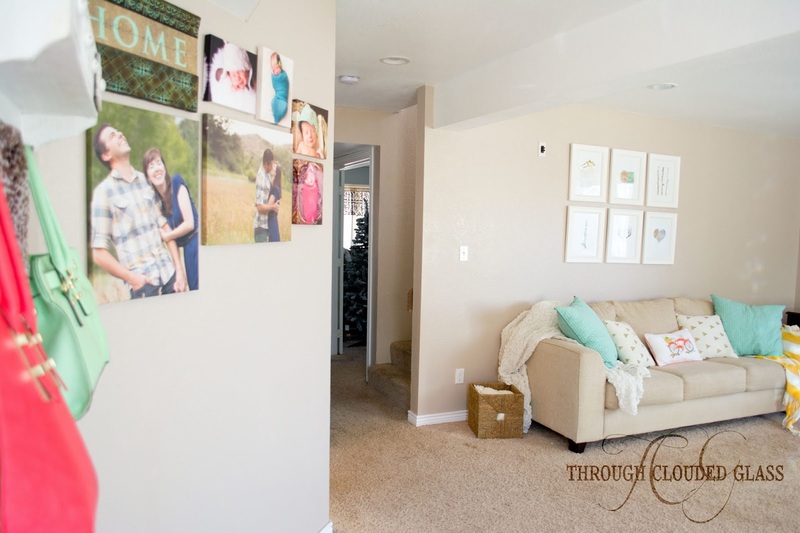 I can certainly see how decorating with photos could become narcissistic, like those movie characters who live alone and have a huge canvas of themselves adorning the wall above the couch. But still, I don't buy that decorating with photos has to be a narcissistic thing. 1. 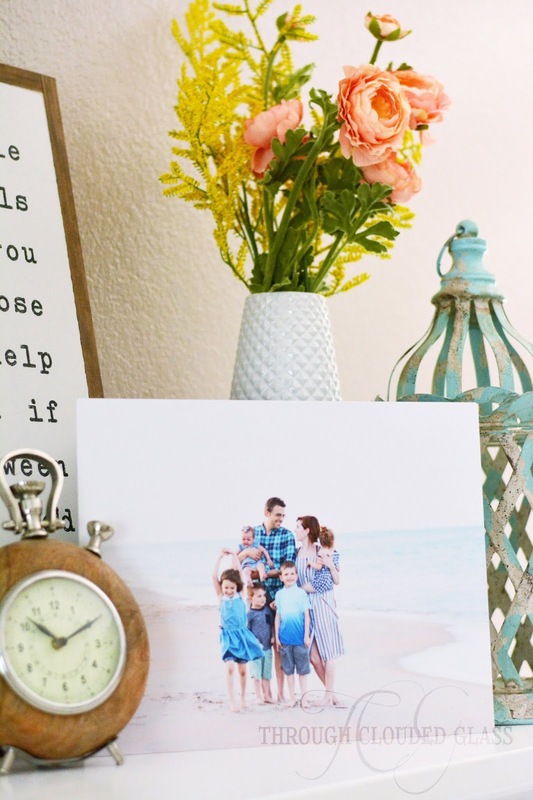 Decorating with photos adds to a feeling of solidarity between family members. 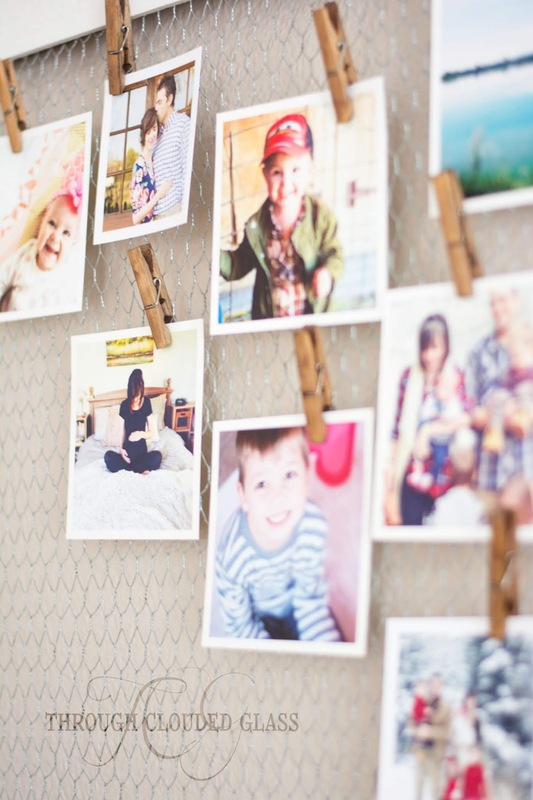 I think about decorating with photos differently now that I have kids of my own. I think that for kids, seeing pictures of themselves with their family on the wall reminds them that they aren't alone - they are part of a bigger unit, a family, and that means something. 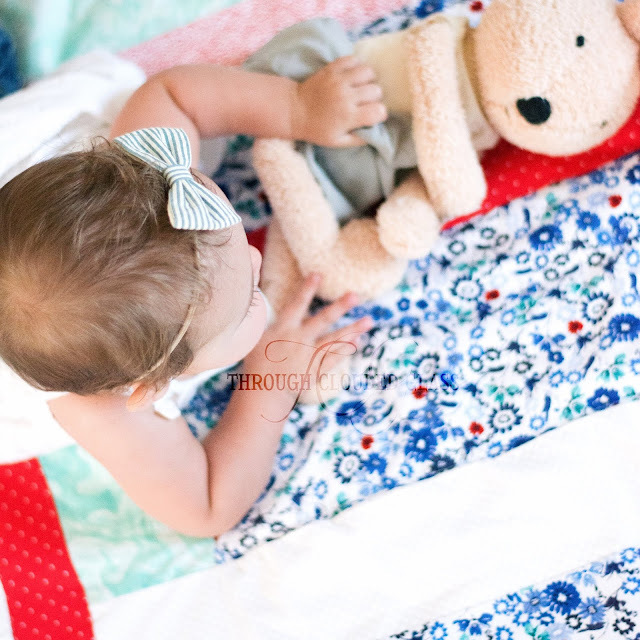 They play an integral role in a family, they are woven through the collective family memories that photos represent. They can look at the walls and visually see their place in the family. In my opinion, that can't help but add some security, knowing your place in the world by being able to see it on the walls. I went to my parents house for the 4th of July, and my sister and I stood looking at an old vacation photo from when we went river rafting. I mentioned something specific that I remembered about that day, and she mentioned something she remembered, and there we were bonding over a shared memory because of a photo on my parents' wall. I'm the type of person who doesn't really remember things until I see a photo - and then a whole cascade of memories floods in. Not everyone is like this, certain personality types are much better at remembering and honoring the past in their hearts without any external reminders, but personally, I need the photos around me to remind me. 3. Photos can be modern "remembrance stones". Remember how the Israelites crossed the Jordan River, and God told them to stack twelve stones from the river bed? When their children asked about the stones, they could tell them of the Lord's faithfulness to Israel. Well, to me, photos on my walls are something like a modern equivalent to that. 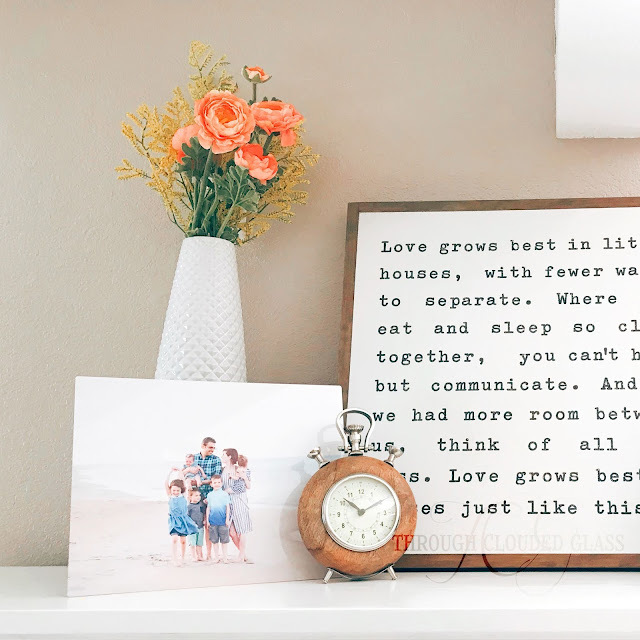 I want to work on this more in my home, by putting photos on the wall that are not only the perfect family photos, but photos that I can point to and say "Remember when God did that?" He has been faithful to our family in many ways, and I want the photos on my wall to not just serve as an anchor for bonding and memories in my family, but also a way to point back to God's faithfulness. 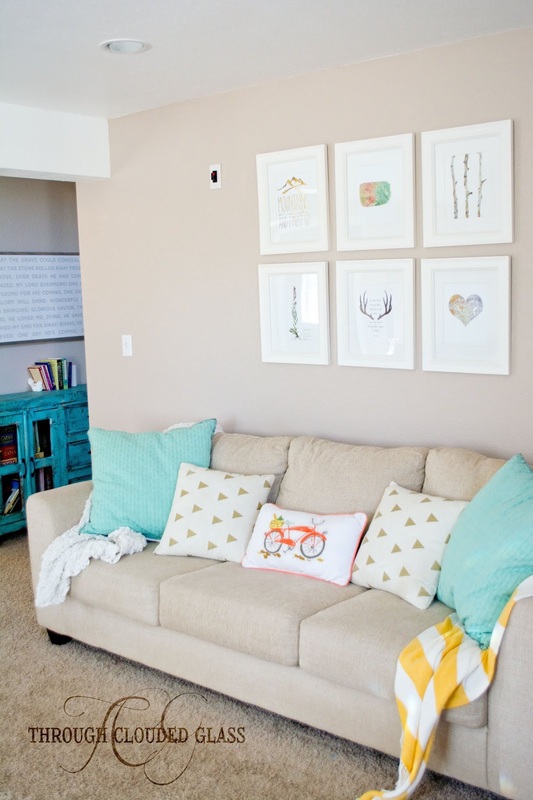 What is your favorite way to decorate with photos in your house? Personally, I am constantly changing it up. 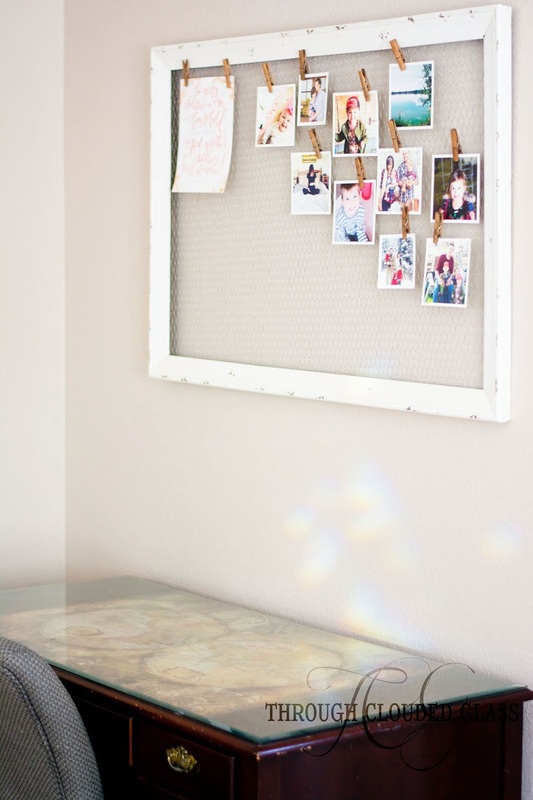 -I have small, square prints on a bulletin board above Derek's desk. -We have a wall collage of canvas prints. Two of the pictures are of Derek and me from our 5th anniversary (they probably need updating since we just hit our 10th! 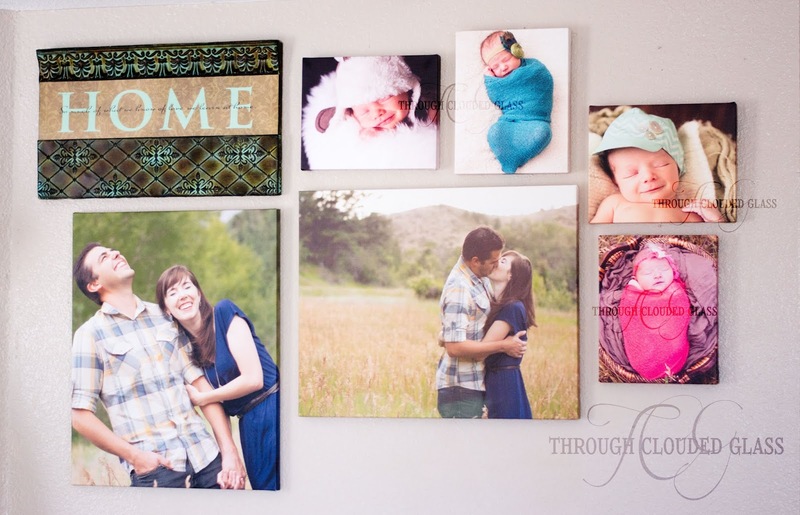 ), and there are smaller canvas prints of each of the kids' newborn pictures. 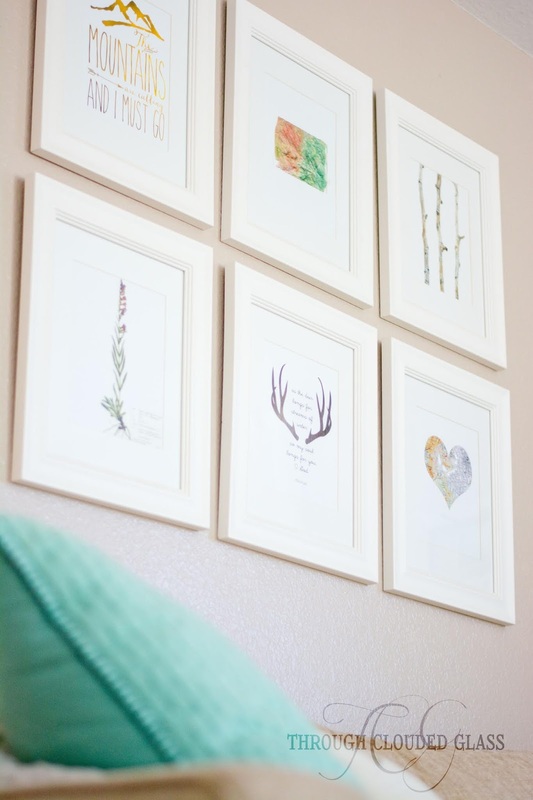 -I had pictures hanging along our stairwell, but I recently took those down because I want to re-do that wall. I'll update when I figure it out. 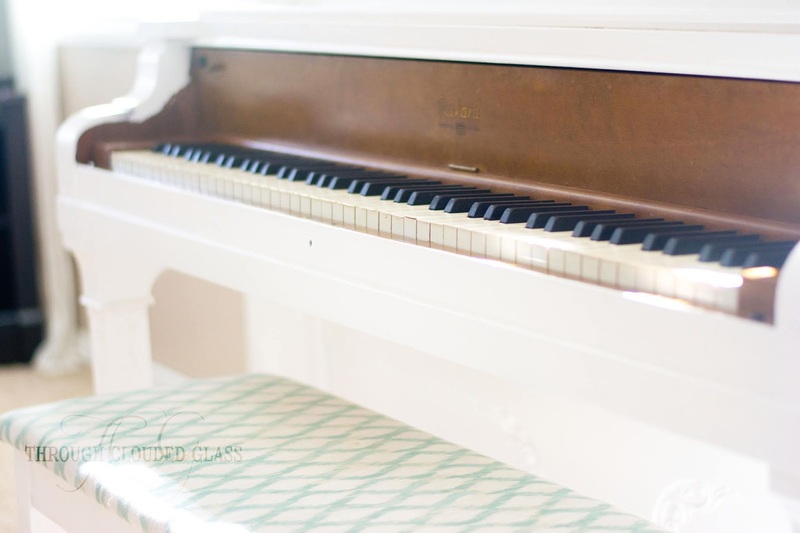 -A metal print on my piano-top (which is basically my version of a mantel display, since I don't have a mantel). 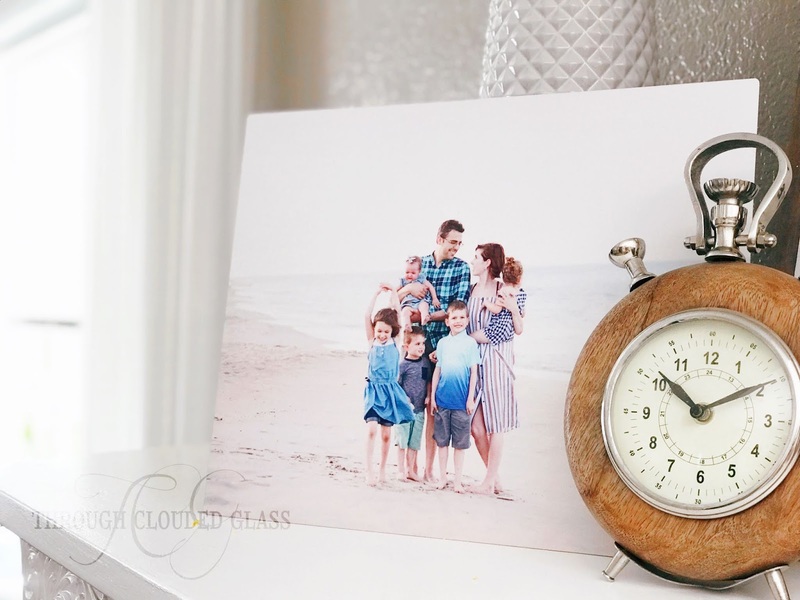 The metal print is the newest addition to my photo decor - Artsy Couture recently asked if I'd like to check out one of their products and sent me this gorgeous metal print! 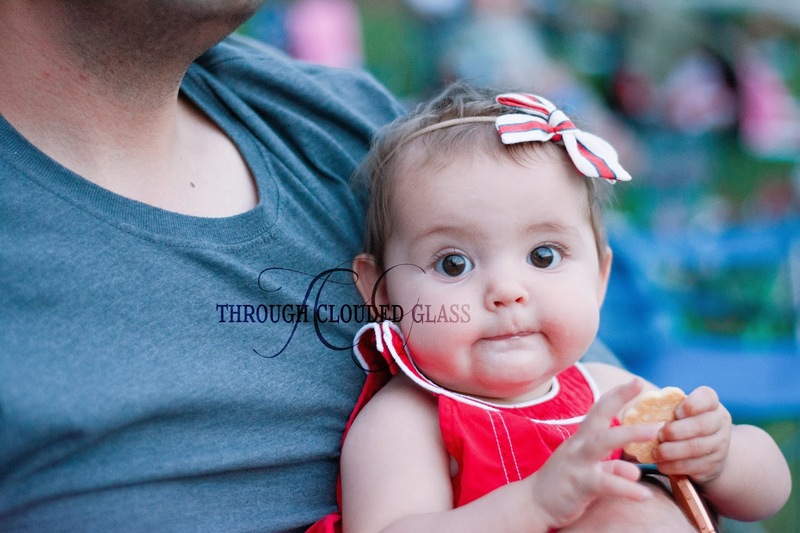 In case you haven't heard of metal prints, the photo is actually printed on a thin sheet of aluminum. The colors are supposed to be brighter and sharper in printing with this method. 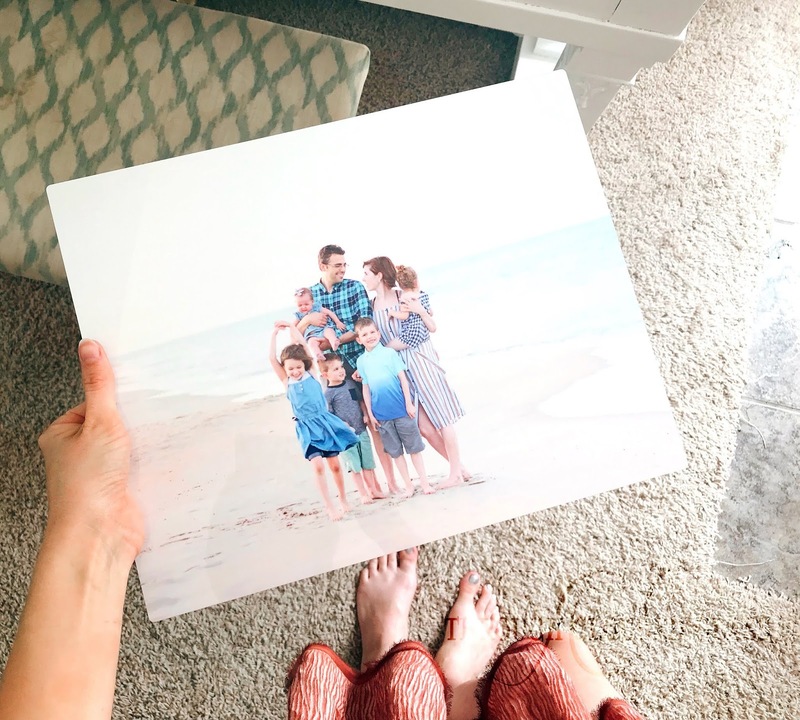 I ended up picking a beach photo from our vacation that I knew was not perfectly focused, but I was so impressed when the print came at how crisp it was anyway! The colors really are gorgeous and vibrant, and it kind of has a certain glow about it that I am assuming is an effect of printing on aluminum. I love the way it turned out, and it looks just as good as I thought it would on my piano-mantel. Bonuses to printing on aluminum: it doesn't get retain dirt like textured canvas might, and there is no glass to break if it falls! 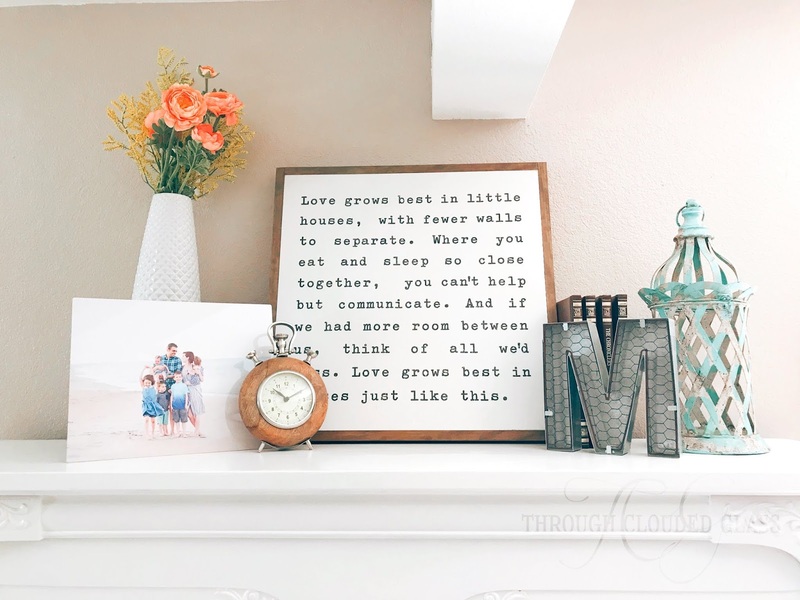 I poked around on the Artsy Couture website and they have a ton of options - not just for metal prints, but canvases, wood prints, traditional prints, cards, photo books, etc. They also happen to be having a sale on large prints that ends tomorrow, so if you are interested, hop on over there and check it out! What do you think? 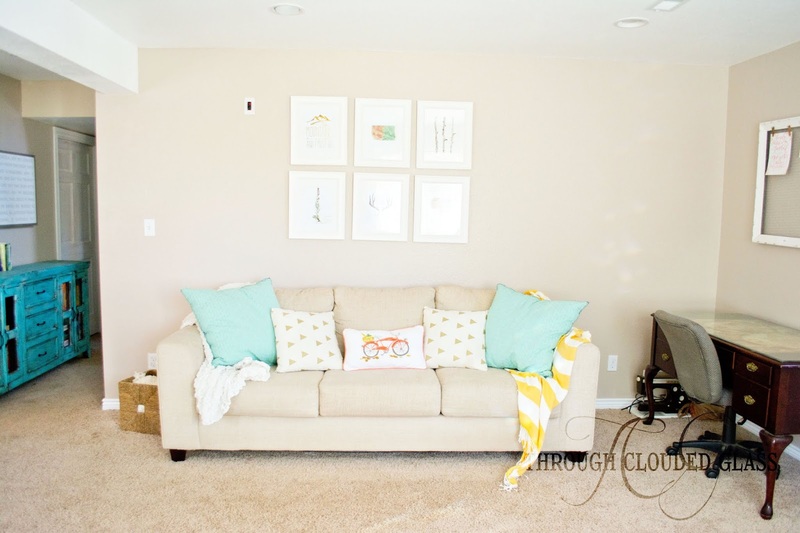 Do you decorate with photos or not? What are your reasons, if you have any? 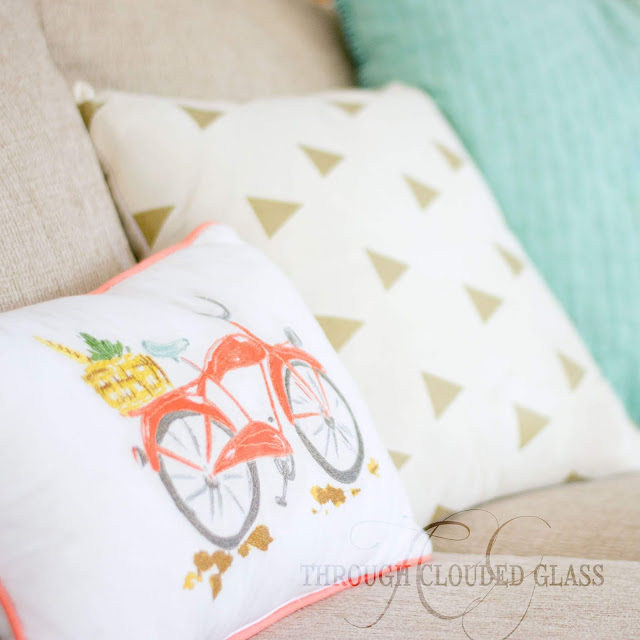 This past week we finished up our homeschool year. I have to say, I was a homeschooled student, but coming from the mom side is a whole different thing. 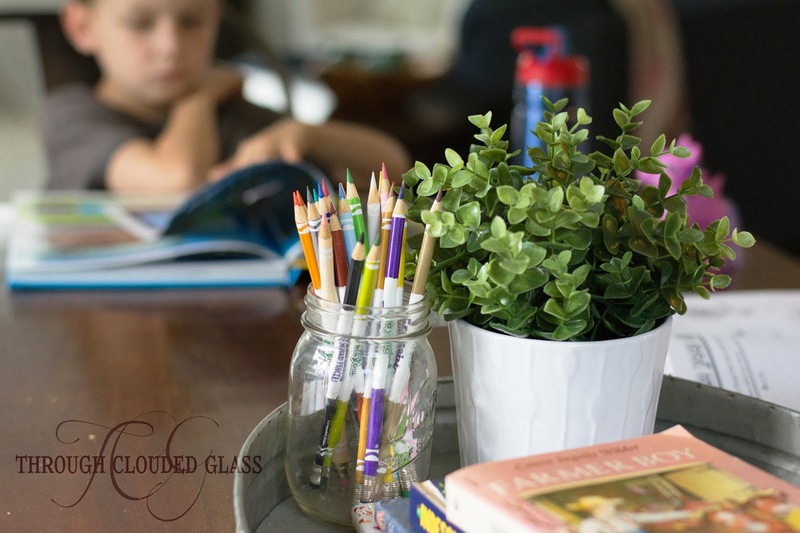 There are a lot of advantages I have as a homeschool mom from being a homeschool student myself, but there are also a lot of things that you can't learn until you are on the teaching side of it. I thought I'd take a little time today to reflect on what I've learned over this first year of homeschooling (first real year anyway - in my book, kindergarten doesn't count). I would in no way consider myself a patient person. Patience is something that I've struggled with over the years - I get impatient when things don't go smoothly, when I have to repeat myself, when things don't go my way. Getting married cured me of some of that. Having kids has grown me even more. But having my kids with me 24/7 and teaching them myself at home is a whole other ball game when it comes to patience. When I mention that I am homeschooling my kids, I've had lots of moms say to me "Oh, I wouldn't have the patience for that." This year I learned that I don't have the patience for homeschooling either. The secret is, a lot of moms who choose to homeschool don't have the patience for it. But homeschooling is an excellent facilitator for sanctification. I know you've heard it said that if you ask God for more patience, He'll give you opportunities to practice it, and that's exactly what homeschooling has done for me. It hasn't always been pretty, and my deep-seated impatience has never been more obvious to me, but I can honestly say that at the end of this year that I am more patient then I was at the beginning of the year. And that's purely through God enabling me and giving me practice at developing patience through this thing called homeschooling. It's hard, but I know this is exactly why I should be doing it. I mentioned in a recent post that we ended up changing curricula in the middle of the year. A lot of homeschool posts will advise you against switching your curriculum, will tell you to give it a really good chance before you drop it. And there's some wisdom in that. You obviously can't be switching curricula constantly - it would waste a lot of money and stunt your child's learning. But this year I learned that when something just isn't working, you should find something else that will. I'm so glad we didn't muddle through the whole year with the curriculum I had originally bought for reading - finding a curriculum that fit was so life-giving to our homeschool days! Switching curricula mid-year does not mean you are a failure for starting with the wrong one. 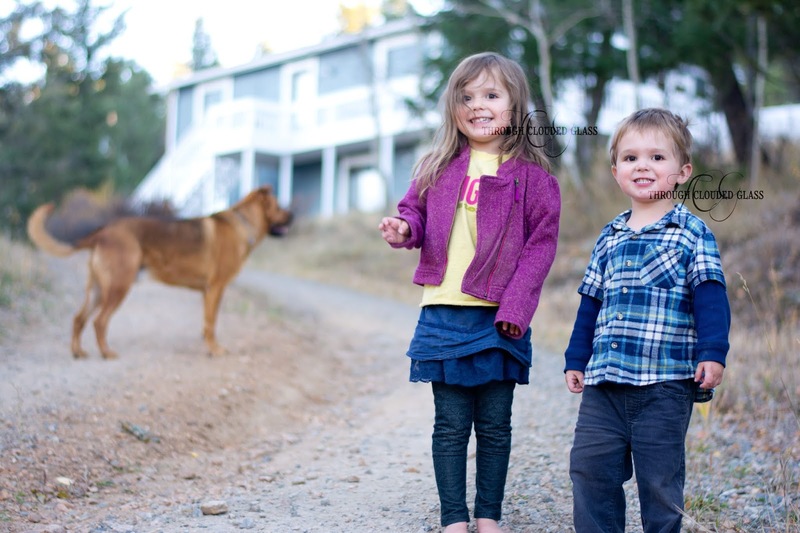 When you are in the early homeschooling years with any kid, it's going to take a little trial and error to figure out what will work best with your unique blend of personalities. I imagine we might have to switch curricula mid-year again at some point since I have five different kids with unique learning needs, and that's okay! 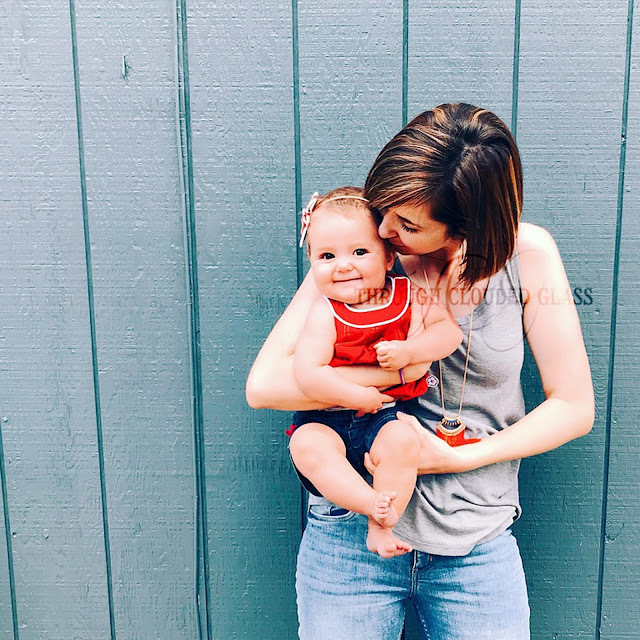 I remember seven years ago, as a brand-new mom, I struggled constantly with comparing my baby to all my friends' babies. I doubted myself whenever another child started rolling over, walking, talking before my own baby. Every new mom has to learn not to compare her baby to others, because every child learns and develops at their own pace. I eventually became secure as a mom as I learned those things. What I didn't expect was for all those insecurities to come roaring back as soon as my oldest hit school age. This year I had to re-learn all over again that kids' learn and grow at their own pace, and that this will necessarily affect the way we homeschool. While kids' need to be challenged to grow, there are also times when they are just not ready for a certain academic skill and you have to sit back and wait until they are. Learning when to challenge your child with a new skill and when to wait a bit - and learning to stop comparing your child to other children - is part of becoming a good homeschool teacher. 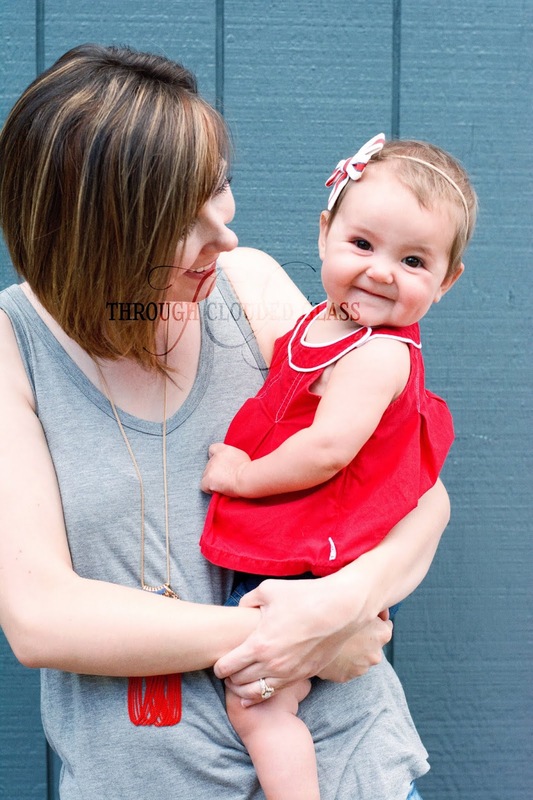 I have to admit, I was nervous about how having a new baby in the house would affect our homeschool year. This is the first year we have had a legal requirement on the amount of days we needed to do school, and I was really worried that having a baby would make it hard to hit our target. But I learned that having a baby in the middle of a school year is not really a big deal. The great part of homeschooling is that it is so flexible! I tried to get ahead a bit by schooling a few days here and there over last summer, but we only accumulated 20 extra days. When Georgie was born at the end of October, I took the entire months of November and December off, and we didn't do a single thing (aside from some field trips). But we still finished up our school year before June! Our school days after Georgie arrived were laid-back and simple - we did practically no school work in the mornings. When the little ones were down for a nap in the afternoon, then we would work on our reading, language arts, and math. When the younger ones got up, we'd read our history and science books together. I was surprised and encouraged to see that homeschooling fit easily into our new life stage - and the key was letting our days be flexible. I'm actually glad I didn't have to deal with getting my kids out the door in the morning and picking them up by a certain time every day, not to mention all the extra preparation for lunches and school events - it might actually be easier to have a baby without sending my kids' to a school building! I am admittedly an academia-loving person. I get excited by school supplies. I love studying and learning new things myself. I actually love the idea of teaching my kids history and science! But there are some areas of being a homeschool teacher that I was not as excited about. I've had multiple friends make comments to me too about not looking forward to homeschooling, not feeling excited or passionate about it. However, through this first year of homeschooling I've learned that it is possible to learn to love what must be done. I can't remember where I first heard this phrase, but it has become a constant refrain for me this year, as we pushed through our lessons on days when I was just not feeling it. It's impossible to be passionate and excited about something all the time, and I think to be successful at homeschooling you have to realize that. You can push through and learn to love what you are doing anyway. It's the difference between the newly-married, heart-pounding love, and the steady deeper love that you have when you've been married for years. As the fresh excitement of the school year faded, and the seeming drudgery of daily work took over, I learned that there is a deeper satisfaction and passion that develops when you push through, as you find the meaningful in the midst of the everyday, as you learn to shake things up and give yourself a fresh perspective throughout the journey. That's how you learn to love what must be done, by sticking with a commitment even when you don't feel a superficial excitement about it - there's a deeper accomplishment, and yes, even a love, that comes with the commitment. Next year is my first year homeschooling two kids in two different grades, so the learning has just begun! Stay tuned. 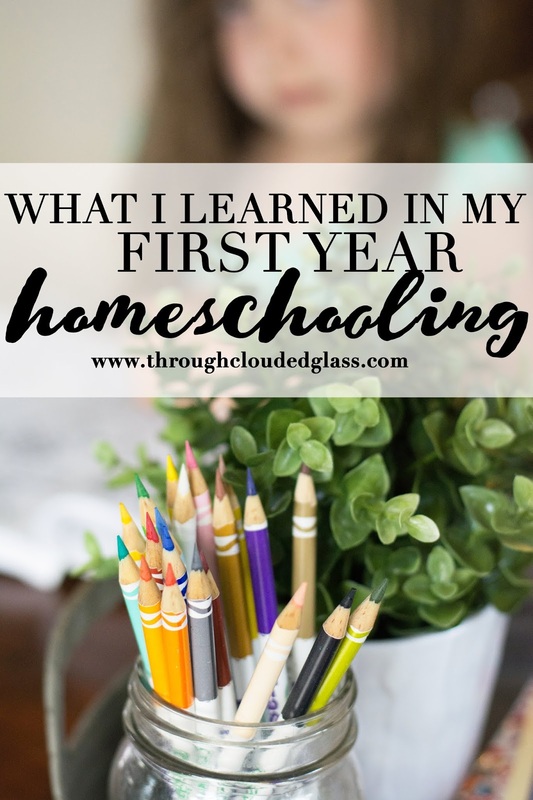 Homeschool friends, what was the biggest thing you learned in your first year of homeschooling?